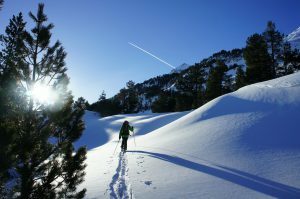 The famous route in Parc Nacional d’Aigüestortes i Estany de Sant Maurici, also known as Encantats Tour or Carros de Foc. From 3 to 5 days completely immersed in the heart of Pyrenees. We present you a ski touring route where you will discover the essence of one of the biggest national parks in the Spanish Pyrenees. With more than 400 lakes, the Park offers a quiet and wild environment, with the great services of the mountain huts, and the traditional gastronomy of the area. 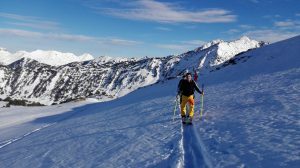 Possibility to adapt the route to weather and snow conditions, groups and availability. 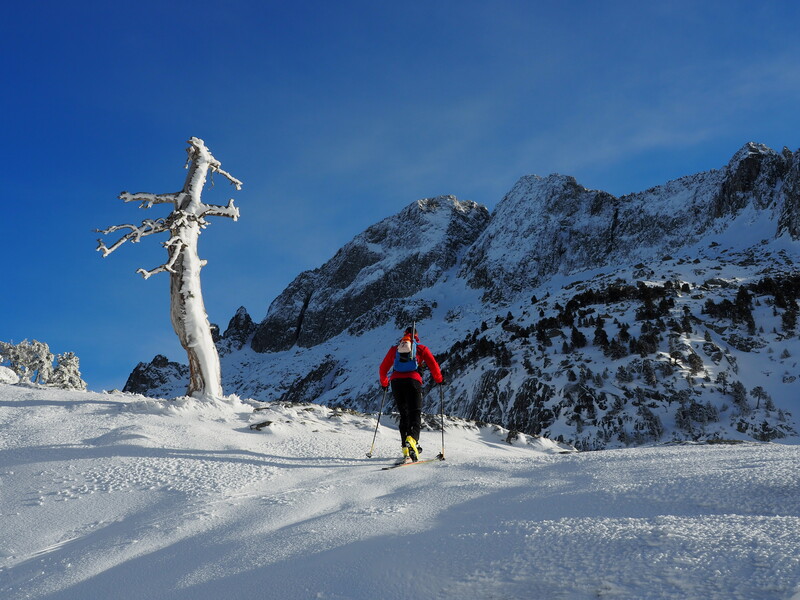 A completely virgin terrain with more than 140km2 to discover. Different mountain huts, with all kind of services and amenities, and excellent gastronomy. Fast access from the airport of Toulouse (1h 30min) or Barcelona 3h 30min). Meeting point in Vielha, and we drive to Pont de Ressec, in our own vehicles. From there we will start touring to Huella Crestada’s pass, going through Restanca’s hut. We will get to Ventosa i Calvell’s hut, where we will sleep. For those with extra energy, possibility to climb Montarto’s peak (2.833m), a classic in Val d’Aran. We will wake up in Ventosa I Calvell’s hut to climb the famous mountain pass of Contraix. 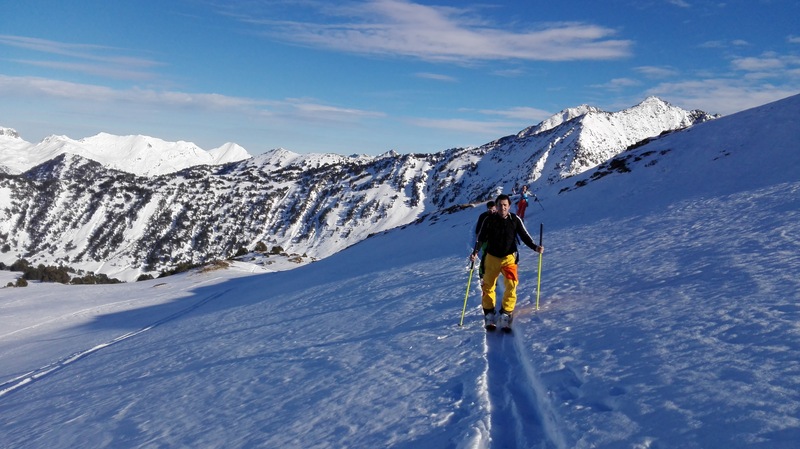 From there, we will enjoy a great descent down to the valley, close to Llong’s hut. After that, we will climb again up to Portarró d’Espot, close to the well-known Sant Maurici’s lake; amazing views and descent. We will finally climb smoothly to Amitges’ hut, where we will rest with all amenities. From Amitges’ hut we will go in the direction of Ratera’s pass, with the option to climb its peak, 2.861m. 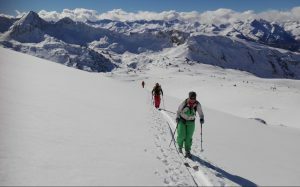 Once here, we will enjoy a nice downhill to Colomers’ hut with the amazing views of the glacial cirque where we will find the best snow… After that, we will climb again to Restanca’s hut and this way we finish our circular route.